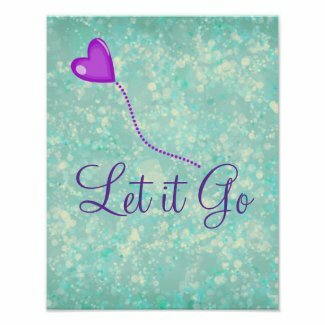 Motivational poster with the quote 'let it go' on a ethereal bokeh background in aqua with light yellow accents. Purple text reads 'let it go' with a purple heart balloon taking off. Tons of various styles, colors and designs from simple to extremely colorful on poster, prints, pillows, necklaces and more. We've featured just a few of them below.... the pillow below is one of our simple and classic designs with the text 'let it go' in pink and a pink balloon fading away. There's also black and pink and more colors to choose from in the making. This inspirational necklace has the same bokeh pattern as the poster above, but we are designing more now in various colors, fonts and designs.